Trade unions representing over 30,000 local council workers today launched a campaign for substantially increased revenue and funding powers for local authorities, and published research that shows Irish councils have less autonomy from central government than their counterparts in 39 European countries. 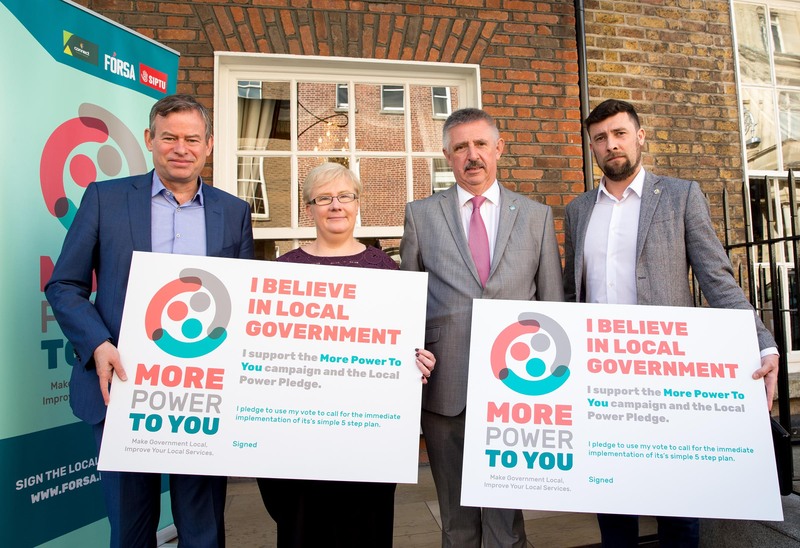 The ‘More Power To You’ campaign also calls for legislative changes to facilitate directly-elected mayors and restore and expand town councils, which were abolished in 2014. The ‘More Power To You’ campaign also calls for legislative changes to facilitate directly-elected mayors and restore and expand town councils, which were abolished in 2014. The research paper, Democracy Works If You Let It by Dr Mary Murphy of Maynooth University, finds that only 8% of Irish public spending occurs at local government level, compared to an EU23 average of over 23%, and that a quarter of the Irish spend is not fully under local authority control. And it says that, with just one city or county council for every 148,507 people, Ireland has far fewer local municipalities than similar-sized European countries. Local government can be an important source of economic development and local jobs, while local authorities across Europe are playing a leading role in transitioning to low-carbon renewable energy. More Power To You campaign page.